A new drone with folding wings and the potential to be deployed on China's third aircraft carrier debuted at Airshow China 2018 in Zhuhai, South China's Guangdong Province this week. Previously only seen in an illustration released a week before the show, the HK-5000G unmanned aerial vehicle (UAV) appeared on display at the booth of the Aeromarine Intelligent Equipment Company, a subsidiary of the China Shipbuilding Industry Corporation. No detailed description was offered at the booth other than it was a medium- and high-altitude long endurance unmanned aerial vehicle. The technical details were not given as the company is still adjusting the vehicle, Liu Yubao, vice manager of the company's research and development department, told the Global Times. 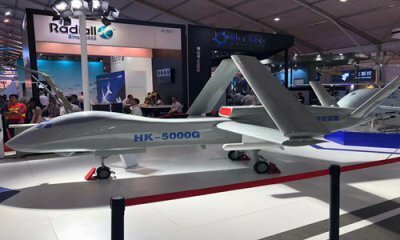 The HK-5000G is a vessel-based armed reconnaissance drone, Liu said. "It can carry a payload for scouting missions or missiles for combat." The vehicle has an endurance of 12 hours and weighs about 5 tons, Liu said, noting that this was only initial data and liable to change. Military observers speculated the folding wings on the drone indicate its potential for aircraft carriers. Folding wings save space on a flight deck and are less necessary on land. Liu confirmed the guess, saying the HK-5000G is indeed designed for aircraft carriers. "We have already made many pre-studies including takeoff and landing on an aircraft carrier and aircraft-vessel adaptation," he said. It's more difficult to take off and land on a flight deck at sea with the space, acceleration and deceleration requirements, Liu noted. Given the HK-5000G's size, its 5-ton weight and its engine, a ski jump takeoff was out, Liu said. The UAV must use a catapult. Aircraft carriers Liaoning and the Type 001A have ski jumps, not catapults. In June an illustration captured at a meeting of China Shipbuilding Industry Corporation suggested that China's third aircraft carrier will use an electromagnetic catapult. As the technology matures, drones will be widely used on aircraft carriers, a military expert who asked not to be named told the Global Times on Thursday. "A vessel-based drone can expand the reconnaissance capability of its mothership and provide fire support," the expert said. Although exhibiting at the November 6-11 show, the drone is not for export, Liu said.